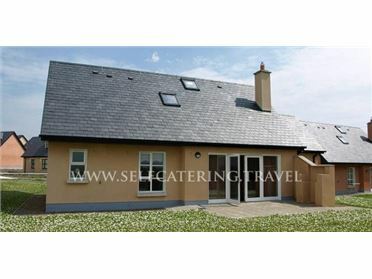 Situated in the heart of Bawnboy Village, 10 minutes drive from Ballyconnell town and The Slieve Russell Hotel in Co.Cavan this comfortable 3 bedroom self catering holiday cottage is well located for touring Cavan, Fermanagh, Leitrim and Northern Ireland. Take a stroll down to the local shop in the morning to hear all the gossip and news, children will be delighted to discover the village playground, relax in the evening with a drink or meal in the nearby pub. The North West of Ireland has much to offer visitors with its spectacular scenery, charming character and exciting heritage. 1 double bedroom, 1 twin bedroom and 1 ensuite family room with a double and single bed. A main bathroom with shower. The Village Cottage has a fully fitted kitchen with washer/dryer, fridge freezer, microwave and has central heating throughout with an open fire in the sitting room and an oil cooker in the living room, both rooms have colour TVs with free satellite and a DVD player in the sitting room. A large enclosed garden, private parking and a secluded patio is at the rear of the Cottage. A large shed is provided for the storage of fishing tackle and fridges are provided for bait. Highchair and cot available free upon request. All linen and towels are supplied. Heating and Electricity are extra and payable upon departure. Storage for bicycles, fishing tackle and bait is provided. There are many walking trails in Cavan such as Bawnboy Loop Walk, The Canal Walk in Ballyconnell, for the more seasoned walker the Cuilcagh Mountain Way will prove a challenge. Visit Bawnboy Workhouse, The Marble Arch Caves & Geo Park, Cavan Burren Park, Florence Court House, The Shannon Pot, Shannon-Erne Blueway or try other activities such as canoeing at Cavan Canoeing , outdoor adventure centre at ODD, teddy-bear making at Bear Essentials, horse riding,or lots more that are only a short drive away.